It's quite fascinating to see the use of watercolour for painting portraits and figures where there's little room for error. Mary Whyte's watercolour paintings are beautiful, there's realism and you can still see the characteristics of watercolour. 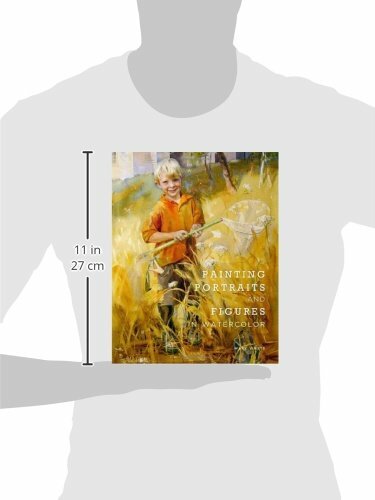 However, this is not really a portrait and figure drawing watercolour book. I was misled by the title to buy this book. While all the examples showcase portrait and figure paintings, the lessons covers general watercolour topics. There are chapters on tools, techniques, understanding values, composition, colours and drawing. All these are very similar to topics in books by other watercolour artists. What's different here is you get to read Mary Whyte's perspective on these subjects, and the short demonstrations that show you how she paints. The paintings tips are all good, but you might have already read them elsewhere. She does try to relate what's taught back to how you can use them for portraits, but not much. The part of mixing skin colour takes only 3 pages. She lists the colours she uses, highlights points to take note of, and there's a quick 3-step demonstration. That's all for colour mixing for skin. I'm surprised and disappointed that there's nothing on painting specifics like eyes, lips, ears and hair etc. There's also nothing much on clothing, especially on how she deals with intricate fabric textures because I see them a lot in her paintings. There's a section on working with models. I found the information there interesting, particularly on the reasons why they are posed a certain way to highlight certain aspects. As a general watercolour book, it's quite good and you get insight into Mary Whyte's process. However, I was expecting much more for a book with a title on portraits. So I won't recommend this if you're looking to learn portraits with watercolours.